Sure it’s obnoxious, but there’s no denying that plenty of people text while walking. I see it happen in New York every day. I even do it myself from time to time. But while I don’t advocate it, I’m not against a way to make it safer, or at least reduce your risk of stepping in dog poop. 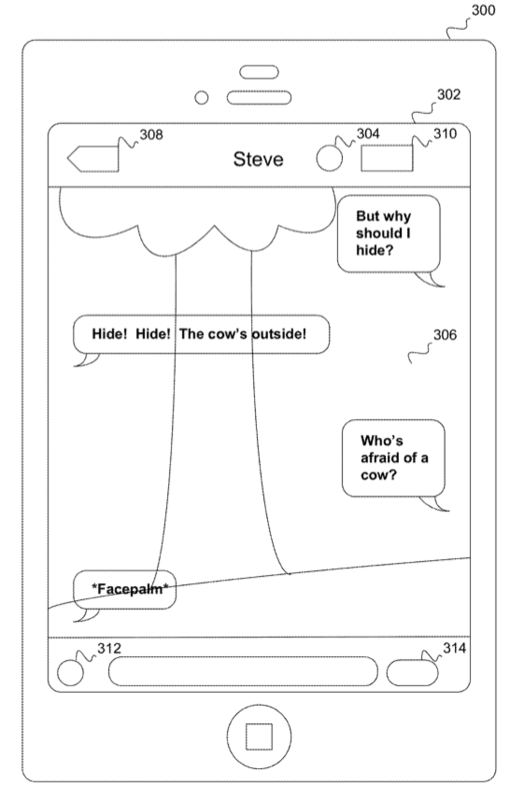 A patent application for “transparent texting” filed by Apple(s aapl) (and spotted by Apple Insider) could do just that. Basically, the back camera on your device can deliver a live video stream over which you can send your text messages. So as you’re looking down at your screen, you’re still able to see what’s in front of you. According to the application, you could activate this feature once in a message, and the traditional background would switch to a video feed over which text bubbles appear. And the actual bubbles could be opaque or partially transparent to make things even clearer. As someone who has almost bumped into a garbage can once or twice while sending a text, I think this is a great idea. But if it ever comes to fruition, I just hope it doesn’t inspire even more people to get on their phones while walking down the block. There is a tweak for this on cydia! But it’s good that Apple might imply it to all it’s apple devices! Even if it’s been around, patents can now be granted on “first to file” basis. So you may hear more stories like this. From my perspective, if that’s a patent, then I’m going to file for toilet paper. Can the public rebut a patent filing by submitting prior art? This might discourage trivial applications, and if they are more expensive to process, then we’ll have fewer courts handling higher quality cases. Prior art doesn’t matter anymore, Obama signed a bill that makes the United States a first to file country instead. Really? No one is going to advocate just pulling over to the side of the sidewalk? Oh sure – I think people have been advocating for years to not text and do other things at the same time – but they get ignored anyhow. Seems like a necessary feature. I see idiots crossing the street in traffic in almost every day texting away and completely oblivious to the cars around them. This is present in Android for many years now. Yes for originality of Apple. Haha. Apple copying Android apps AGAIN. Theyre not copying android. Its just a safety feature. So chill your buns. The issue isn’t literal seeing, it’s mental focus. I’ve been with drivers who were so busy talking that they failed to focus their attention on a moving car that was clearly visible where their eyes were looking. Besides, human peripheral vision is more that enough to alert us to moving dangers to the side if we’re alert to dangers directly ahead. Dear the rest of the world. If you are unable to look at your phone and walk – GET THIS ASAP. This is something I thought I would NEVER be spoken about, commuters are unable to look at ANY device whilst walking at the same speed or they just bloody stop smack in front of you, it is a wonder muggings and pickpocket rates havn’t smashed through the ceiling. This has existed on Android since the dark ages in the form of “Transparent Screen” apps, among others. Surely, this can’t be patentable when so many others have already done it..This has existed on Android since the dark ages in the form of “Transparent Screen” apps, among others. Surely, this can’t be patentable when so many others have already done it.. I don’t know why the comment got duplicated? This has existed on Android since the dark ages in the form of “Transparent Screen” apps, among others. Surely, this can’t be patentable when so many others have already done it.. There hasn’t been smartphones for “dark ages” lol but yeah the jailbreak team had this out before android was thought of.